Coming soon! 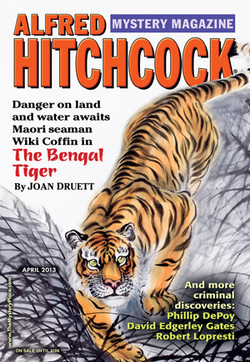 Alfred Hitchcock Mystery Magazine. Industrial Gold sees frustrated actor Marlin Hammerbach return to a dreaded factory job. When Katie Roberts discovers an illegal greenhouse on her ranch, she gets a lesson in the ambiguity of the new Colorado marijuana laws. While she may have mixed feelings about the issue of legality, her thoughts are clear on what should happen to the person responsible for injuring her favorite saddle horse, the cantankerous rescue mustang Daisy. My story Do-Over is about vengeance, and a survivor’s hope that enacting justice can erase a painful past. Blood and Gasoline is described as Mad Max meets Sons of Anarchy. ​Seventeen stories screaming past the red line, tires tearing across the highway, guns stained with smoke and gore. 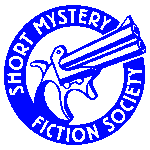 Seventeen stories of heroes and anti-heroes on desperate journeys, white knuckles on steering wheels, hearts pounding to the staccato beat of magnum hollow points slamming against flesh and steel. Seventeen stories of hard-bitten souls hurtling over asphalt, the desert, the sea, and even through space itself in adventures fueled by vengeance, betrayal, madness, and murder. Seventeen stories of tough justice, redemption, and salvation. On an Oklahoma farm, a reluctant granddaughter assists her feisty grandmother do the Lord’s work of ridding His garden of some weeds. Marlin Hammerbach believes he is overqualified for the life of a worker bee in a dismal factory, but his community theater acting career has stagnated. He needs his much-hated supervisor’s signature to apply for a promotion, but Paul Sneed is nowhere to be found. 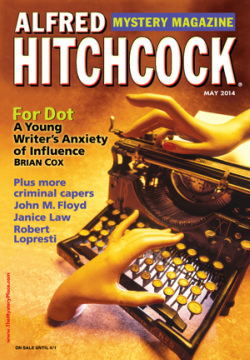 I wanted to take a moment to write and say how much I enjoyed your story "Industrial Gray" in December's issue of Alfred Hitchcock Mystery Magazine. There were several elements that made me know I was in the reassuring hands of a strong storyteller, from the light tone and propulsive pace you set to your ability to sketch the quirky personalities of multiple characters through brief descriptions and some well-chosen and revealing dialogue. Using Paul Sneed's animal shorthand from his planner to give the reader an immediate sense of the characters was an inspired touch. The chemistry between your leads Marlin and Jazzmyn was both engaging and, by the end, a little poignant. It was interesting to see on your website comments that the story was inspired by an assembly-line job that you once held. That binary between the blue collar workfloor drudgery and the separated, snooty office environment of white collar administration was really intriguing. Thanks for creating that story; it was a pleasure to read. 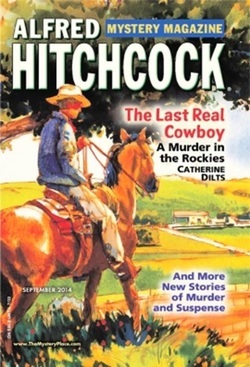 Katie Roberts is willing to do just about anything to protect her Colorado cattle ranch, including confronting a drunk cowboy in possession of a firearm. When she finds the old guy dead in the bunkhouse, Katie doesn’t believe he committed suicide. With the help of her ranch hand Tosh, a dreadlock wearing buffalo soldier wannabe, Katie tries to determine whether it was the elderly cowboy’s womanizing ways that got him killed, or his sudden interest in an endangered toad living in Katie’s pond. Individual electronic issues can be purchased through Magster. Dr. Charles Jerome Harrison, scientist at a gasket factory, plays the role everyone expects of him – the jolly fat man. When a back-stabbing employee is murdered, Charles cannot fathom how he lands in the center of the investigation. He is certainly not the only employee to have opportunity and motivation. His new intern, a skinny college kid with a bad case of ebonics, suggests that being African American makes them both the focus of police scrutiny, a paranoia seemingly confirmed by the detective’s probing questions. Besides, as the kid points out, threatening the victim just hours before her demise doesn’t exactly make Charles look innocent.